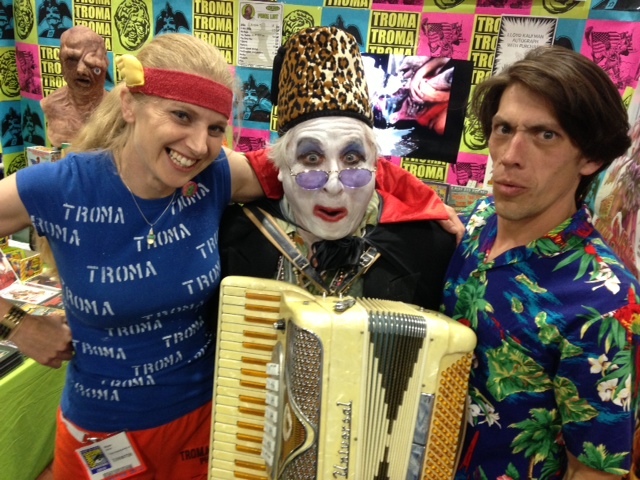 Join Lloyd and the Troma Team November 1st-3rd at the Comickaze Expo in Los Angeles, CA! 496 year-old cult icon/recording artist/actor, Count Smokula, will be joining the Troma Team with his thundering squeezebox at Stan Lee’s Comikaze Expo 2013, taking place from November 1st to 3rd at the Los Angeles Convention Center, to celebrate and serenade the guest of honor, Lloyd Kaufman, and the accomplishments of Troma Entertainment. He will appear at the Troma panel on November 2nd and will be performing at the Troma booth. A long time friend of Troma, The Count has appeared in and composed music for multiple Troma films including ‘Father’s Day’, ‘Poultrygeist’, ‘Tales from the Crapper’, and ‘All the Love You Cannes’. He also wrote and performed The Tromadance Theme Song. Count Smokula has performed and emceed with Troma at The Cannes Film Festival, The San Diego Comic-Con, and numerous Tromadances, AFMs, and book-signings. He hosts ‘The Count Smokula Show’ on cable television and the web, and has two albums on iTunes, ‘Authentic Sounds of Smokesylvania’ and ‘Smokesylvania in My Mind’. Guest of Honor, Lloyd Kaufman, (President of Troma Entertainment and Creator of ‘The Toxic Avenger’), will also be joined at the Troma booth by the Toxic Avenger, Mark Torgl, (star of ‘The Toxic Avenger’ and ‘The First Turn On’), and Ron Jeremy (Entertainment Industry Legend), for a weekend of truly Tromatic excitement! More Troma celebrities to be announced. Throughout the convention, Comikaze will be presenting a number of exclusive Troma screenings, informative and entertaining panel discussions, and special, intimate, autograph sessions and photo ops with Lloyd Kaufman for no charge at the Troma booth, where there will be all the latest and greatest Troma merchandise available! This entry was posted on Thursday, November 1st, 2012 at 11:41 am	and is filed under Events. You can follow any responses to this entry through the RSS 2.0 feed. You can leave a response, or trackback from your own site. You are here : Home » events » 2012 » 11 » 01 » MEET LLOYD! – Comikaze Expo in Los Angeles!